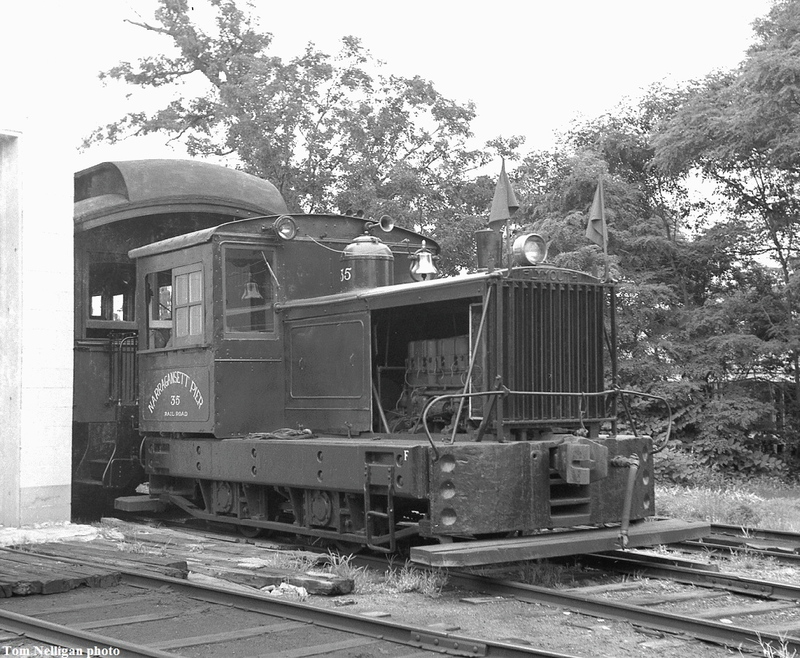 This neat little engine was Narragansett Pier 35, a 25-ton outside frame gas/mechanical switcher built by the Plymouth Locomotive Works in 1929. Seen at the shortline's Peace Dale, RI, headquarters, it supplemented the NP's "big" engine, a 65-ton Vulcan. Sadly, the NP was abandoned in 1981 after years of minimal freight traffic, and much of the line is now a bike trail. Photographed by Tom Nelligan, July 19, 1969. Except for the outside frame, this is very similar to the 25 ton Plymouth gasoline-mechanical at Draper Corp. Beebe River plant. After 1925 when Draper bought the Beebe River sawmill from Parker-Young, it was used to haul wooden frame log bunks up as far as Guinea Pond just beyond the Sandwich Notch Road in an effort to log off old growth hardwoods. It owed its later years to being the only engine heavy enough push the snowplow.